Found 3 file extension associations related to MPwin and 3 file formats developed specifically for use with MPwin. The purpose of this application is the ability to measure and thus a work out budgets and certifications, building on foundations of traditional and parametric prices that meet the format FIEBDC-3 95/98. Works with both Euro and pesetas and switch to another currency. It is a multi-document and multiple budgets for each document or certification. 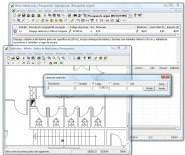 Supports traditional measure including new formulas and measurement of DXF or DWG drawings from graphics module using only the mouse as a measurement tool. Various adjustment options of the total budget of work or one chapter or the price of a unit of work. Update on a percentage of all or a group of prices, applying indirect costs, maintenance of additional direct costs and maintain various alternative prices for the concepts of simple pricing. Generate reports such as measurements and budgets, Chapter Overview, Summary table, prices No I, No price Table II and Table of prices of materials. With direct printouts to a powerful word processor like Microsoft Word. If you need more information please contact the developers of MPwin (Procedimientos-Uno, S.L. ), or check out their product website.